At the end of last week, I was at the AISB 2014 symposium on New Frontiers in HRI, held at Goldsmiths College, London. Held over two days (well, not quite full days...), it was modestly sized (around 30 on the first day, fewer on the second), but with plenty of time given over to discussion, it was a good size to have the majority of people engage in talking and discussing with one another. The range of topics was quite eclectic (within the HRI theme of course), but there were enough people with wide enough interests/experience to keep the discussion going to greater extent than I was expecting - sometimes, I find that scheduled discussions fall a bit flat with a few too many awkward silences, but that wasn't the case here. I gave a little overview of my work on applying a memory-centred cognition perspective to social human-robot interaction. I don't think I did particularly well at summarising the particular approach I take, but reckon I at least managed to get across some of the broad ideas involved. Seeing as my starting point is relatively uncontroversial (my assertion that memory is in some way involved in all aspects of human-robot interaction - indeed any social interaction), this was what I hoped. In any case, I tried to make a clear distinction between the the theoretical framework I was proposing, and the actual computation model I have developed to start to explore this question. The reason for this is that I know there are flaws in my implementation (as a model, this is in principle inevitable), but I didn't want people to dismiss the underlying idea as a consequence of this. The general panel discussion afterwards was mostly centred on the role of emotion in HRI (which was a fascinating discussion), but there was a little on these memory-centred ideas too, in which I tried to reinforce the theory rather than my implementation of it (who knows how successfully!). Elsewhere in the symposium, the one general AISB keynote lecture I went to was given by Humberto Maturana. 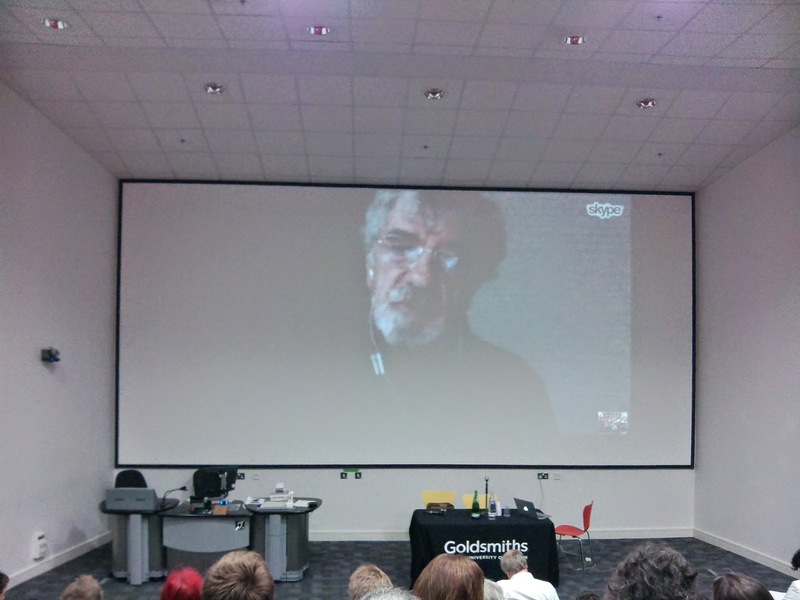 While it was given over skype (bit too far for him to come over in person...), it was still great to hear him speak in (virtual) person, as someone whose ideas had been such a profound influence on multiple fields of research, and of course my own. It was quite a wide-ranging talk, encompassing many different fields, but all tied together with the central theme of autopoiesis for which he is known. He structured this around four man questions: (1) what kind of systems are robots; (2) what kind of systems are living systems; (3) how does the nervous system operate; and (4) how do we operate as self-conscious beings? The result was an eclectic mix of topics (from life and death, to language, to ethics, and more besides), but which still maintained a coherency that I could follow (as far as I could understand at least!). Humberto Maturana giving one of the AISB 2014 plenary talks over Skype. Finally, just a quick note on the workshop I organised last month at the HRI conference with Greg Trafton on Cognitive Architectures for HRI. It was very well subscribed to (over 30 people for the session, which compared very favourably to other workshops running simultaneously), which was more than we were expecting. The invited speakers (Yiannis Demiris, Matthias Scheutz, and Angelo Cangelosi) provided a very good structure, covering a range of topics and perspectives that (according to the various comments from people afterwards) were engaging and indeed appreciated in terms of providing a different take that some were familiar with. Indeed, this also proved to be one of the drawbacks to the workshop: given the half day (and a few little technical issues...) we didn't have the time for discussions of any great length. I take it as a good sign though that people were dissapointed by this, and is certainly something that could be rectified if we were to organise another one.